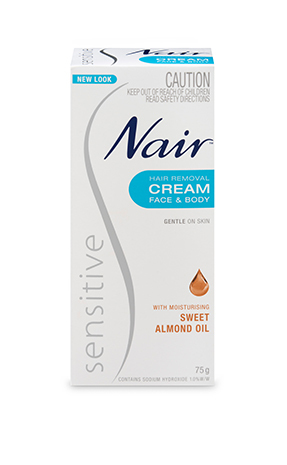 Nair Sensitive Hair Removal Cream with moisturising Sweet Almond Oil is specially formulated for sensitive skin and is gentle enough to use anywhere on the body – legs, bikini area, underarms and face. Enriched with Almond Oil which is rich in Vitamin A B & E, it helps to maintain moisture levels of the skin and prevent irritation. 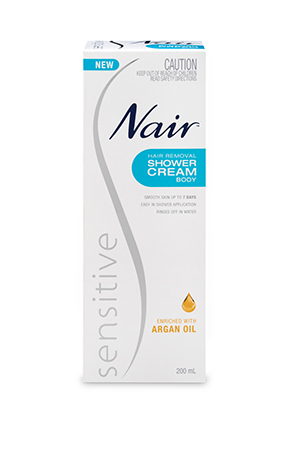 Perfect for sensitive skin, Nair Sensitive Hair Removal Cream will moisturise your skin leaving it soft and smooth. Available in 75g and 150g size. Smooth on thickly to cover hair. DO NOT RUB IN. After 3 – 4 minutes, test a small area. If hair is not easily removed, re-apply and wait longer. DO NOT EXCEED 10 MINUTES. For especially coarse or hard-to-remove hair, saturate hair with warm water for several minutes before, pat dry, then apply. DO NOT SWALLOW. Rinse thoroughly with warm water using a washcloth. DO NOT RUB OR USE SOAP. Pat dry. Cap tube tightly when not in use. If I wash my hair after applying the cream, will it act to remove the hair on my head? As a precaution, we advise you to wash your hands thoroughly after applying and removing the Nair™ product before continuing with your normal shower routine. What is the shelf life of the Creams? Can I use a depilatory cream on my skin if I have a cut or abrasion? No, it doesn't affect the rate your hair grows back, nor the thickness of the hair shaft. Depilatories contain ingredients that work by breaking the chemical bonds that hold hair together. The bonds give hair strength and structure, so when you break these bonds, the hair can easily be washed/wiped away and removed. How does depilatory cream compare to razor shaving? Depilatory creams work by dissolving the hair just below the surface of the skin whereas shaving sharply cuts the hair off at the skin surface. 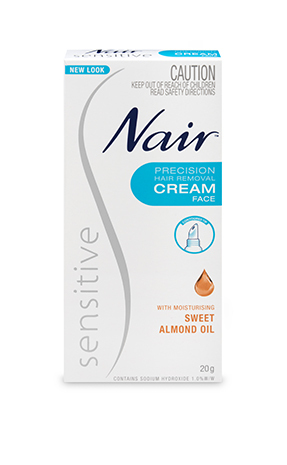 This means you’re not left with unattractive prickly stubble whilst the Nair™ creams help moisturise and exfoliate your skin. How does a depilatory cream work? In three ways: 1. 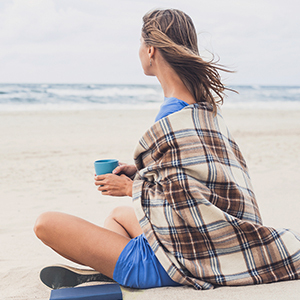 Unlike a razor, depilatory products remove hair just below the skin surface. Hairs emerge from pores - and depilatories dissolve both visible hair and some of the hair in the pore. This means it takes longer for the hair to grow back. 2. A depilatory acts as an exfoliant, removing unwanted dead (often rough) skin cells on your skin surface. 3. Many depilatories (including all Nair™ depilatories) contain moisturising agents, such as Baby Oil, Almond Oil and Aloe Vera, which assist in giving you softer, smoother skin. What are the benefits of depilatory creams? Depilatory creams will give you smoother skin for days longer than shaving. However, the follicle is not removed from the root, being only removed at or slightly below skin level. Also, as it is chemical based, you’re advised to not leave creams on your skin longer than advised on the pack. Why do I need to do a patch test before using a depilatory cream each time I use it? What is a depilatory cream? Depilation (means ‘removing the hair’). A depilatory is simply a cream or lotion for removing unwanted hair. A strong, alkaline based cream is placed on the hair and reacts with the protein structure of the hair to break down the hair follicle, until it turns jelly-like. The depilatory hair removal process takes between 3 - 10 minutes before it can be easily wiped off with a warm towel or washed off with water. It's considered to be a fast, inexpensive and easy method of hair removal.